4. Click on Install for Admin only (the update will run with the admin user who setup the app). After install Currency Updater, you will have a 30-day free trial. Can we test Currency Updater Pro in a Sandbox org? Yes, of course. 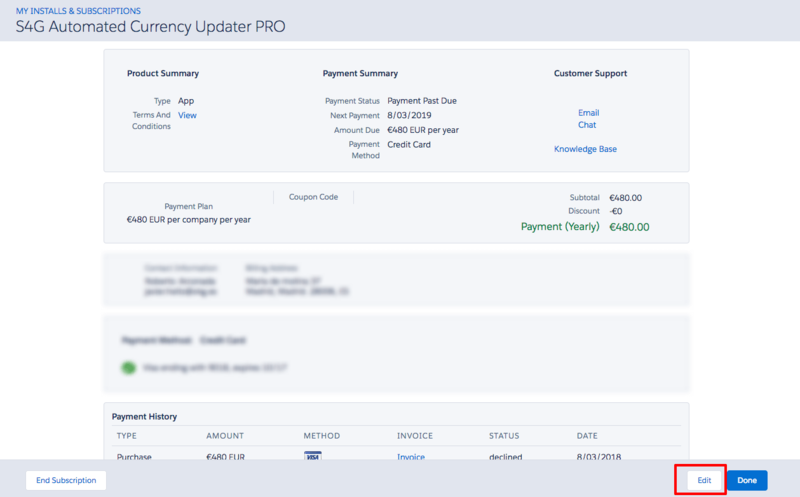 You can work with Currency Updater Pro in any type of org and it is really easy to set up. Try it in your sandbox and install it in your preferred org. Just remember, you can only have one license by org. Do I have to create a different user for Currency Updater Pro? No, the application uses the SSO (Single Sign On) feature of Salesforce to make it easier for you. The main idea around this app is for you to forget that you have it. Just install it, set it up on a breeze, and let it work! 1. Set the Authorization by clicking the Authorize button and allowing the application. 2. Select the tables to be updated. 3. Select the exchange rate source. 4. Set the frequency and time when Currency updater must run. Why do I have to authorize Currency Updater? Currency Updater needs to update your currency exchange rates. To update them, an administrator user is required. We don't store your credentials in any place. How do I change running user? 1. Log in to Salesforce with new user credentials. 2. Go to Currency Updater Setup tab. 3. Click on "Authorize" button and enter user credentials, if Salesforce ask for them. 4. Go to "Schedule" tab and click on the "Schedule" button. In Salesforce, there are two types of currency configurations: Basic Currency and Advance Currency (Dated). The difference between using Basic Currency Exchange Rates and Dated Exchange Rates is that the former has no history associated with it. However, when your org makes changes to a Dated Exchange Rate, the history is preserved for tracking. This is especially helpful when exchange rates fluctuate significantly. When a change is made to the Basic Exchange Rate, there's no history logged about the previous rate. This change affects all opportunities, forecasts and other amounts that use the current conversion rate; something which can significantly affects profit projections based on opportunities stored currently in the system. This is more likely to have a major impact on large, multi-national companies than on small businesses. What are your currency sources? How accurate are they? The information is taken from Google, European Central Bank, Bloomberg or Currencylayer, it is under your choice. For us, it is crucial to have as much information as we can to be as accurate as possible, but it is important to keep in mind that currency values might differ a little between suppliers and also depending on the time of the day they are consulted. How many currencies does Currency Updater PRO support? You can only use this source when your corporate currency is Euro. Unfortunately the service that Yahoo offered has been closed and we cannot get the information regarding the exchange rate. For this reason, all users that use Yahoo as a database source, will be redirected to Google. Access to your Currency Updater configuration to choose the one that fits your needs. When are currency values updated? Can I schedule the update? Now, with Currency Updater Pro is extremely easy to configure and setup: you can schedule the update to run daily, weekly, monthly and at the time of the day you specify. Usually this error happens when you have scheduled the update and system schedule the job for the next day. Please review if you can view the job in Setup > Monitoring > Scheduled Jobs or Setup > Monitoring > Apex Jobs (check that you don't have a custom view that could be filtering out the jobs). 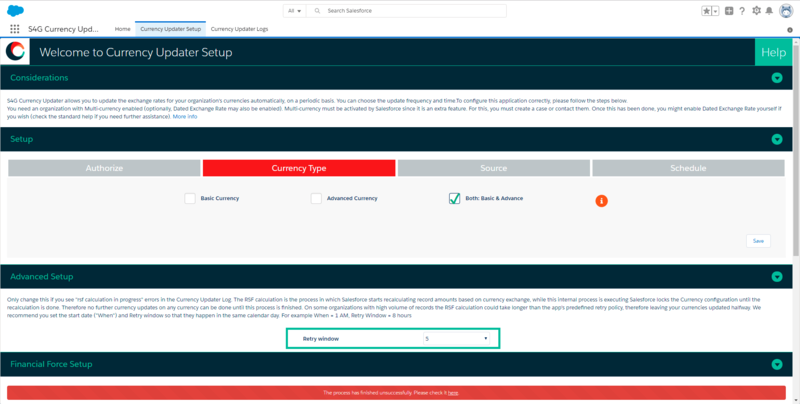 In some Salesforce Organizations, Salesforce doesn't allow to update a currency due to external reasons to CUP (Currency Updater PRO). In this cases, a Currency Updater Log with KO status will appear for each currency, with the following error "...can't be updated on SF. Error: ...". This error occurs when Salesforce has to do multiples recalculations in many records with a currency field. When this recalculations are in progress, Salesforce doesn't allow to update the remaining currencies. Should this problem arise, we have already implemented a new feature that fixes it. Until all the currencies configured and located in the selected source are updated, CUP will execute the update process every 5 minutes for the number of hours selected on the section "Advanced Setup" of "Currency Updater Setup" tab, as maximum (5 hours default). You will see several records of Currency Updater Log, one for each retry. When you are getting this error, you need to take into account that the currency update will delay for some hours. Please, schedule the update with a sufficient time frame. How often are the currency exchange rates updated? When the update is processing, system get currencies from Currency Type object (Basic), which have not been updated in that day. This means that only one update per day will be processed. Salesforce shows an Authentication error, what is happening? You need to setup your Salesforce. Log in on "Start Currency Updater" tab by clicking on "Authorize" button. If the problem persists, please try to uninstall and reinstall the app. I run a job and nothing shows up in the log, what is the problem? When you setup the App, you can click on the “Schedule” button or on “Run now and Schedule”. If you clicked on “Schedule”, the process will execute on the next day. Please review Setup > Monitoring > Scheduled Jobs where you will find a pending job with the date / time when the process will run next. How does Currency Updater’s Log work? Every time the App runs at your scheduled time, results are saved on a system log. You can check in the "Currency Updater Logs" tab whether the rate update was unsuccessful, and see the issues found or see the exchange rates that came over when successful. If you have enabled both currency exchange types (Basic & Advance), system will add one line for each of them. The first one will be the Basic and the second one the Advanced update. In some Salesforce Organizations, Salesforce doesn't allow to update a currency due to external reasons to CUP (Currency Updater PRO). In this cases, a Currency Updater Log with KO status will appear for each currency, with the following error ""...can't be updated on SF. Error: ..."". This error occurs when Salesforce has to do multiples recalculations in many records with a currency field. When this recalculations are in progress, Salesforce doesn't allow to update the remaining currencies. Should this problem arise, we have already implemented a new feature that fixes it. Until all the currencies configured and located in the selected source are updated, CUP will execute the update process every 5 minutes for the number of hours selected on the section ""Advanced Setup"" of ""Currency Updater Setup"" tab, as maximum (5 hours default). You will see several records of Currency Updater Log, one for each retry. The application's payment model is based on a yearly subscription of 40€ per company per month (billed yearly), the payment is done directly through the Appexchange listing via the Salesforce checkout process in which you'll be asked for your credit card information when making the installation on your production org. We will send you an invoice when the trial period expires and the payment is done. You can manage your Currency Updater account going to My Account page on the AppExchange page. Here you will see all your account and subscriptions information. 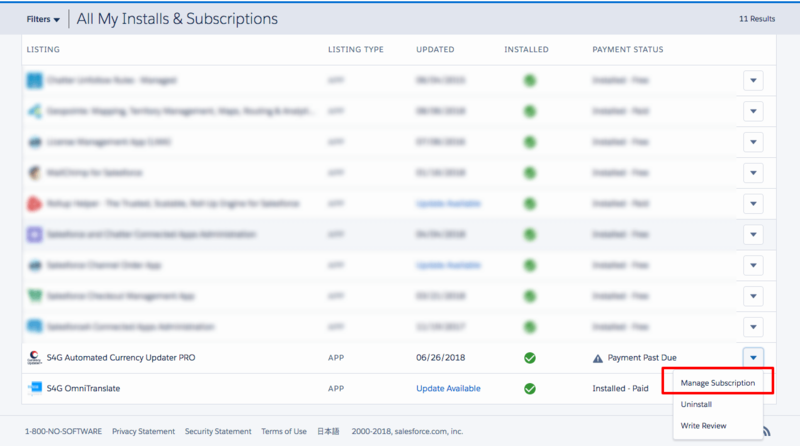 Does Currency Updater integrate with Salesforce CPQ? Salesforce CPQ uses standard currency exchange management. 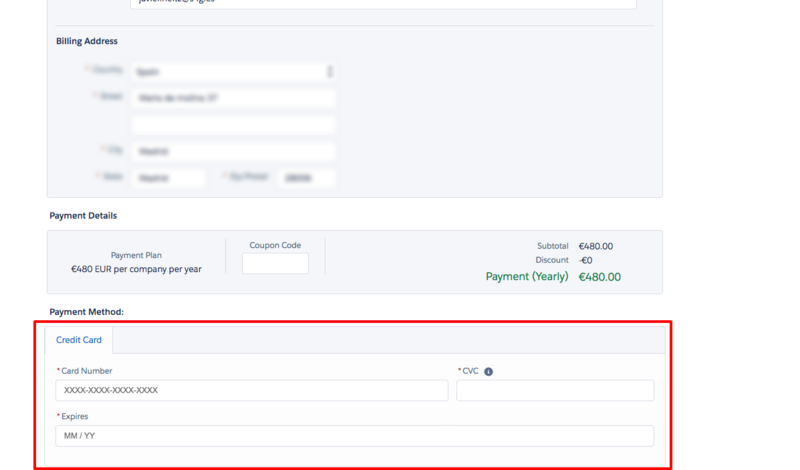 We know that some objects, for example Quotes, are customised when CPQ is used, which means that in Salesforce there are two types of currency configurations: Basic Currency and Advance Currency (Dated); custom objects are only supported with Basic Currency. The difference between using Basic Currency Exchange Rates and Dated Exchange Rates is that the former has no history associated with it. However, when your org makes changes to a Dated Exchange Rate, the history is preserved for tracking. This is especially helpful when exchange rates fluctuate significantly. When a change is made to the Basic Exchange Rate, there's no history logged to the previous rate. This change affects all opportunities, forecasts and other amounts that use the current conversion rate; something which can significantly affects profit projections based on opportunities stored currently in the system. This is more likely to have a major impact on large, multi-national companies than on small businesses. S4G Currency Updater allows you to update the exchange rates for your Salesforce organization’s currencies automatically, on a periodic basis. You can choose the update frequency, source, time and exchange type (Basic, Advance or both). And if I have any problem, how does Currency Updater Pro notices me? 1. Go to the AppExchange. 2. Click on Log In (top right-hand corner) and introduce your credentials, if needed. 3. Click on the picture (top right hand corner) and click on "My Installs & Subscriptions". 4. Locate "S4G Automated Currency Updater PRO" and in the right side, click on the arrow and "Manage Subscription". 6. Click on Edit Payment. 7. Introduce the new credit card details and click on Review Changes and Save. - Prioritized sources. If a currency is not available on the first source set by default, it would search for it on the next ones. - Improve logs with more descriptive messages, notifications when a process fail and setup options. - Improve setup page with a "News" section. - We are always opened to any suggestion about new improvements from you.